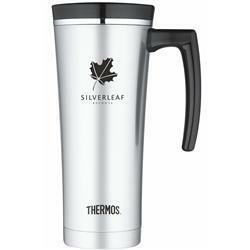 Thermos™ Sipp Travel Mug with a handle. Vacuum insulation technology for maximum temperature retention, hot or cold. Lid made with BPA free Eastman Tritan™ copolyester to resist stains and provide durability. Built-in tea hook, easily holds tea bags or most loose leaf infusers. Durable stainless steel interior and exterior. Dishwasher durable, top rack recommended. Compatible with most single cup coffee makers. Keeps hot for 5 hours and keeps cold for 9 hours. 16 oz capacity. Thermos is known for quality and performance! 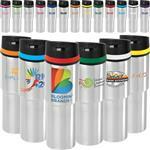 One of our favorite vacuum insulated travel mugs!